A Laois postmaster who dedicated his lifetime to running the family post office, has passed away just months after his retirement aged 81. Aidan Kennedy from Ballinakill has died unexpectedly at his residence, on Monday November 26. 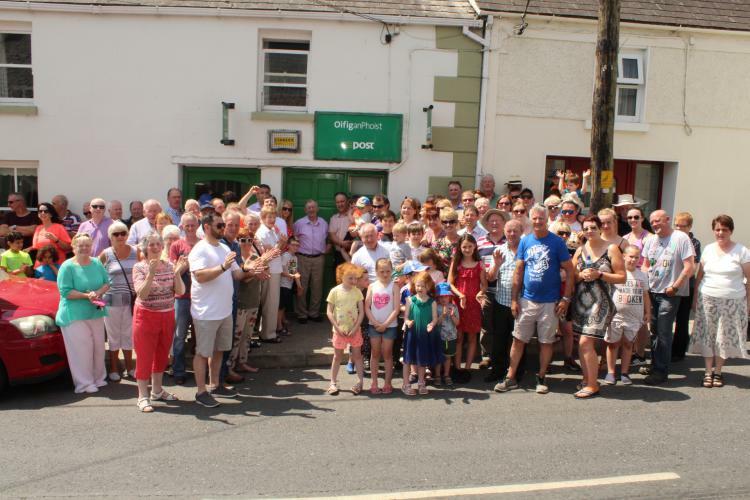 He retired last June 30 due to ill health, and with no-one to replace him it also marked the closure of the village's post office. He talked to the Leinster Express at that time. “They are all disappointed. There is no chance of keeping it open. I am sorry for the people who use the post office so well, they are so nice, I have never had much trouble with anybody,” he said. Mr Kennedy had developed a lung condition in recent years that meant he required constant oxygen, even while working behind the counter. He had been Post Master in Ballinakill for 51 years, a family job that began with his aunt Julia in 1881, and continued with his mother. He had one employee who worked with him two days a week. “It is the end of an era. I am 51 years a postmaster, I will miss the title. My son Declan was willing to take it over a few years ago, but that idea was shot down by An Post,” he said. Mr Kennedy had served as club secretary for Ballinakill GAA Club for 40 years. The club has written a touching tribute online to him. "Aidan Kennedy: One of our greatest. As a community we were rocked this morning by the very sad news that we had lost one of our most beloved members. Whilst for Sadie and family the loss of Aidan is immeasurable in comparison to ours, the community of Ballinakill has lost one of its greatest sons. Superlatives and hyperbole is often fired around in the modern times in descriptions of events or individuals, but no amount of words can summerise what a giant of the community Aidan was. "It has been reported in numerous places of all the organizations he was involved in and how he gave himself 100% in his help of others. He was archetype volunteer. Committed. Hard working. Self less. Honest with a fantastic sense of humour. "A role model for all to follow. Our busy world would be a better place for more Aidan Kennedy’s but we can honestly say there will never be one like him again. A person who modeled all that is good about rural Ireland. "As a GAA club we were blessed to have him serve every role within the club. His lifetime of dedication ensured that there is an outlet for Gaelic Games in our village and in particular for our young people. His 40 years as club secretary is an achievement that is truly staggering, but in typical Aidan fashion he did it in his own unassuming and diligent way. "We extend our sympathies to all the Kennedy family at this difficult time but will celebrate a life that has left a positive impact on all our lives. You will be missed Aidan, by one and all. Ar dheis Dé go raibh a anam," the Club said. Mr Kennedy's death is deeply regretted by his loving wife Sadie, his daughter Jane, sons Aidan, Brian, Luke, Declan, John and Des, extended family and friends. Reposal was at his residence on Monday and Tuesday evenings with Rosary at 9 pm. Removal will be on Wednesday morning at 10.30 am to St. Brigid's Church, Ballinakill for Funeral Mass at 11 am. Burial afterwards in St. Brigid's Cemetery. House Private on Wednesday morning.